Neptune, the eight and last planet in the Solar System is named after the Roman god of the sea. This green-bluish giant is quite similar to Uranus in size and composition, but is much farther from the Sun. It takes about 164 years to orbit the Sun. Like other gaseous planets Neptune turns fast on its axis, making the day only about 16 hours long. Though you can't see Neptune with the naked eye. However, you can locate it with binoculars, but you will need a fairly large telescope in order to distinguish something more than a small disk. Continue reading more about Neptune's atmosphere, interior, exploration, moons and rings. Neptune's atmosphere is made from about 80% hydrogen and 19% helium. It also contains a small amount water and methane, which give rise to the green-bluish color. The dark blue and bright white features of the atmosphere help distinguish Neptune from Uranus. The thin cirrus-like white clouds contain methane ice. When hydrocarbon snowflakes form in Neptune's atmosphere they melt before reaching the surface because of the high pressure. The fastest winds in the Solar System blow on Neptune. With speeds of about 1,240 mph, they are five times faster than the strongest winds on Earth! Neptune's core, which is approximately the size of the Earth, is believed to be composed of rock and ice. The core is covered with a thick mantle that contains water, liquid ammonia and methane, mixed with gases. It is bitterly cold on Neptune, with an average temperature of about -210°C. However, it's warmer than would be expected for a planet this distant from the Sun, since Neptune has an internal energy source like the rest of the giant planets. 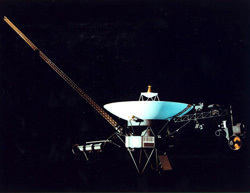 The only spacecraft to visit Neptune, the Voyager 2, reached the planet in 1989. This mission revealed valuable information impossible to collect with earth based telescopes. For example, the Neptune's rings appeared like arcs when viewed from Earth telescopes, yet Voyager 2 cameras showed that they are actually complete rings made up of large particles and broad bands of dust. The spacecraft studied Neptune's violent atmosphere and discovered six new moons orbiting around the planet. Neptune has a small dark ring system, similar to Jupiter and Uranus. It has four distinct rings formed from rock, ice and dust. With the exception of the largest moon, Triton, all satellites are quite small with diameters ranging only a few hundred kilometers. Four of them orbit the planet between the rings. 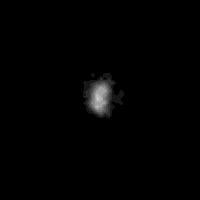 The outermost moon, Nereid, has a long elliptical orbit. Triton is one of the most peculiar moons in the Solar System. With a diameter of about 2,700 km it is the only large moon that orbits in retrograde, or backwards, with respect to the planet's rotation. 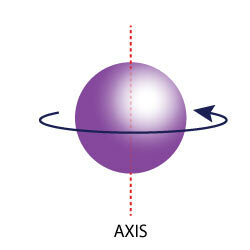 In addition, its axis is highly tilted with respect to Neptune's orbit. Similar to Uranus its poles are pointed toward the Sun. This makes Triton very geologically active. During the winter the poles are covered with ice caps like Mars. They are made from frozen nitrogen, which is responsible for the pinkish color. The rest of the surface is covered with methane and nitrogen ice, forming regions with ridges and valleys. Only a few impact crates are visible, which indicates that the surface is relatively young. Surprisingly, powerful geysers erupt on Triton. They form because deep under the surface frozen nitrogen melts under the high pressure. When the nitrogen rises it erupts as a combination of vapor, dust and icy crystals shooting up 8 km above the surface. The Great Dark Spot photographed by Voyager 2 in 1989 was a hurricane-like storm about the size of the Earth, and rotated backwards around Neptune with speeds of up to 700 mph. It disappeared five years later, but new dark spots formed within a few months. Neptune has an odd magnetic field, similar to that of Uranus. It is tilted at 50 degree to its axis and moved about 6,200 miles off the center. The magnetic field might be generated by flows deep down in the interior. 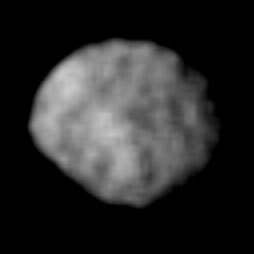 Proteus is the largest of the new moons discovered by Voyager. It has a diameter of 271 miles and a giant 93 mile wide crater. 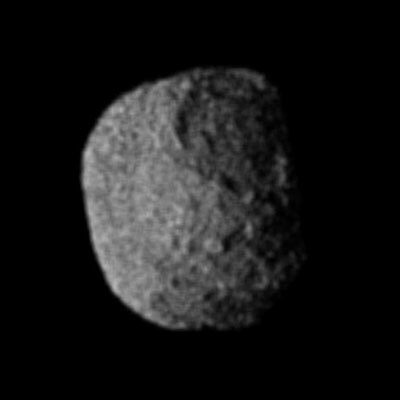 Although Proteus is larger than Nereid, it was discovered later for two reasons. First, because of its dark surface the moon reflects less sunlight and looks fainter. 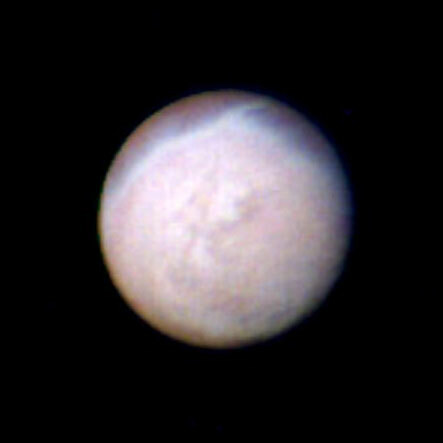 Second, it orbits almost on the top of Neptune's clouds and is hidden in the planet's glow most of the time. 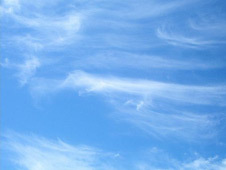 A type of cloud appearing as wispy strands that are white to light gray in color. A chemical compound made solely of hydrogen and carbon.